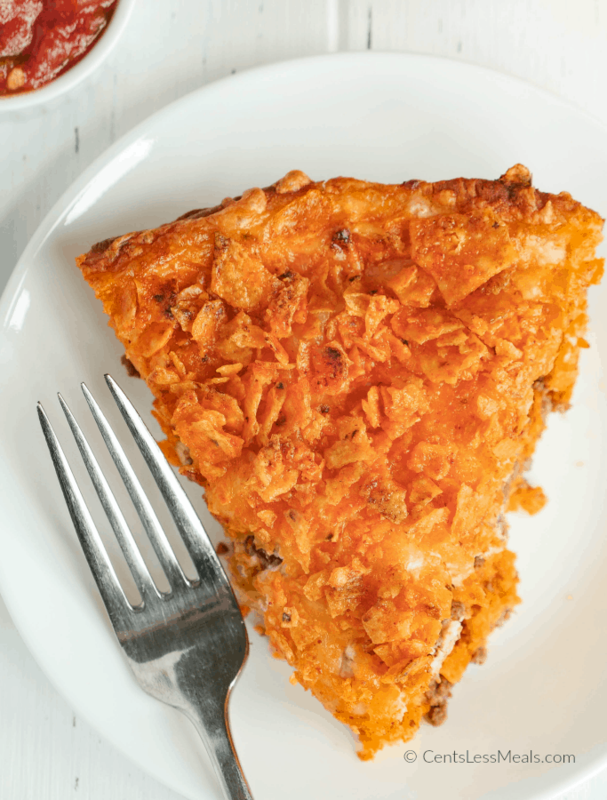 This easy Dorito Pie is one recipe everyone will agree on! Layers of seasoned beef, sour cream and Doritos all nestled in a crescent roll crust and baked until hot and bubbly. 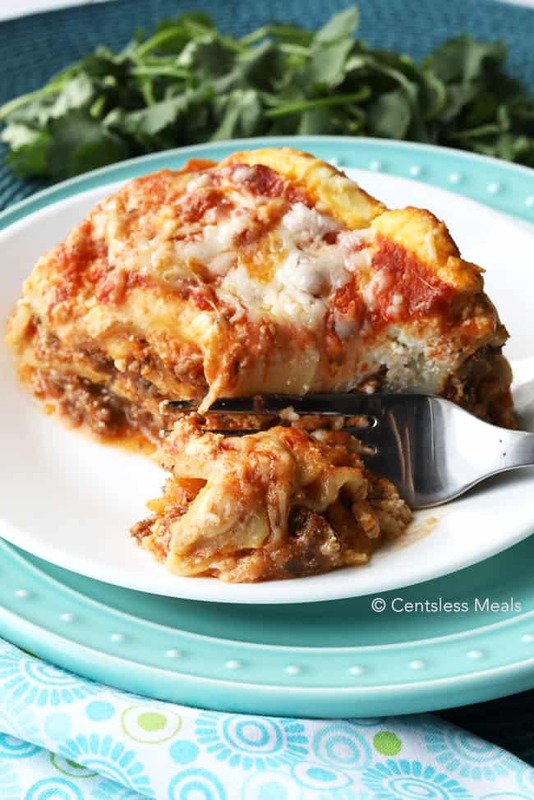 I absolutely love Mexican inspired meals from Chicken Enchiladas to Taco Casseroles. They just tend to have so much flavor with all of the delicious seasonings. 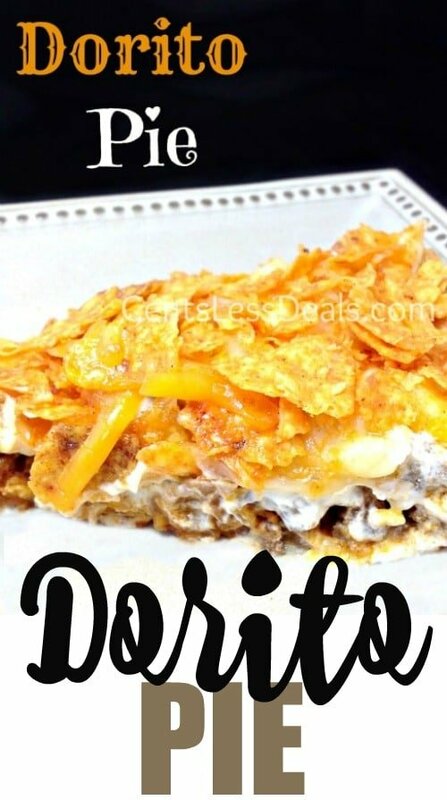 We’ve been enjoying Frito pie pretty much forever, I love the way the Fritos add a delicious corn flavor and I knew that Doritos would do the same in this recipe! One of the best things about this recipe is that it’s one everyone will agree on! Layers of seasoned beef, sour cream and of course delicious Doritos all nestled in a crescent roll crust and baked until hot and bubbly. We start with a crescent roll crust and layer it with seasoned beef, salsa and sour cream. If you happen to have leftover chicken (or even ground chicken) both will work perfectly in this casserole! I like pepper jack but you can really use any kind of cheese for this recipe with great results (cheddar is good too). You can certainly use your favorite flavor of Doritos as well, we like the Nacho Cheese or if you can find them, the Taco flavored Doritos… but any kind is great. 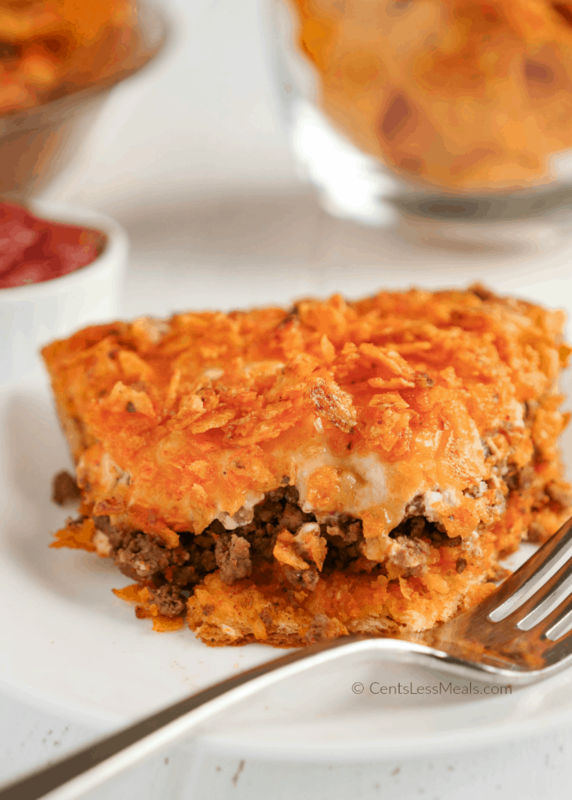 Layers of doritos, seasoned beef and delicious sour cream create a meal that everyone will love! Brown ground beef over medium heat until no pink remains. Drain any fat. Stir in taco seasoning and water and simmer until thickened (about 5 minutes). Spray a 9" pie dish with nonstick cooking spray. Separate the crescent dough into triangles and line the pie pan placing the points towards the center of the dish. Press the seams to seal. Sprinkle 1 1/2 cups of crushed Doritos onto the crescent crust. Top with ground beef. Combine sour cream & salsa. Spread over the ground beef layer. Top with cheese and remaining Doritos. Drizzle with melted butter. Bake 20 minutes or until the crescent crust is golden brown. 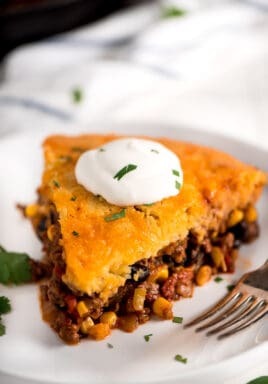 This pie is delicious served as is but I often put out an array of toppings like fresh lettuce, diced tomatoes, black olives and of course pickled jalapenos and let everyone top their own. Either way, this is one meal your whole family is going to love! I printed out 11 new recipes this morning, this being one of them and was so excited to try something new. Sorry to say but crumbled up the printed out recipe after we “tried” to eat it. First of all way way waaaaay too much Dorito. I divided like the recipe called for but felt that the 1-1/2 cups for the top could easily be cut in half. Not a fan…plus I didn’t feel it had much flavor. Husband ate it and he usually will eat anything and will almost always say he liked it but not so much for this recipe. Threw half of it away, sorry but epic fail for this family. But glad the rest of you enjoyed it. Sorry to hear you didn’t enjoy this recipe Jill. Thank you for trying it. Can you add can or frozen corn to meet mixture? Thank you!! That’d be delicious Kathy! Let us know if you try it! 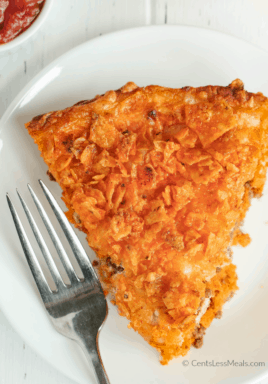 So glad you love the Dorito pie Loulou. My family does too! How can I bake this without getting the top too brown? My oven bakes much quicker than most. I made it just now and the edges are brown but the top is dark. I couldn’t get it as pretty as it’s suppose to be and I have no idea yet if the crescent rolls are done. I put my oven on 375 and it was already browning and had 9 minutes left.. Should I put it on 350 the next time? If my oven is a bit hot, I loosely place a piece of foil over the top to help keep the browning down. Hope that helps! So glad to hear you two loved it! As another poster said, yes, I can see doing this with leftover rotisserie chicken, ranch or Lipton soup packet, cream of any soup, your favorite white cheese. Love recipes like this that can be made multiple different ways. Yes, it’s versatile and delicious! Enjoy, Donna!! I haven’t doubled it, but don’t see any reason why not. Let us know how it works out for you Heather! I just made this tonight and I loved it. I topped it with more sour cream. Love the crunchy Doritos. Happy to hear you loved it Linda! I’ve fixed this a couple of times now and fixed some refried beans on the side. It’s really a nice dish! So glad to hear you love this recipe Diane! Going to try this tonight. How finely crushed should the door Rito’s be? You can crush them to about the size of a cornflake, but really any size will work. Can I put it together in the morning and pop it in the oven later in the day? I’ve only made the recipe as written Sandilee. I think you could make it ahead. I’d suggest adding the Doritos on top right before baking. You may need to adjust the baking time as well. Let us know how it turns out! 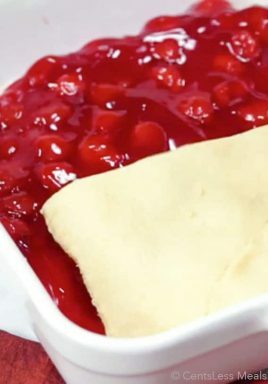 Does any one know if I can prepare this and cook it the next day I wanna bring it to a work party ? My family LOVED this! Thank you. Looks and sounds good. I’m going to give these a try. I was skeptical about baking it with the sour cream mixed in, as well… I did a FB salmon patty recipe with sour cream in it and did not like it because of that… Going with my past experience on this. Looks good but too many of these recipes need altering. This recipe is delicious as written. I’ve not had sour cream and salmon together however I often eat sour cream with tacos or mexican inspired dishes and it works perfectly in this recipe. Wonder how this would be with a pie crust instead? I found this casserole to be very dry! Flavors were good but…..not worth my time. My family wouldn’t eat it!! This is wonderfull!!! 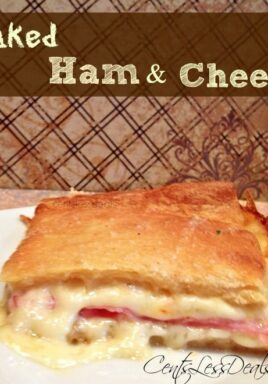 I’ve been wanting this recipe for years, I ate it once when I was a teenager..never forgot how delicious it was!!!! This is soooo good. 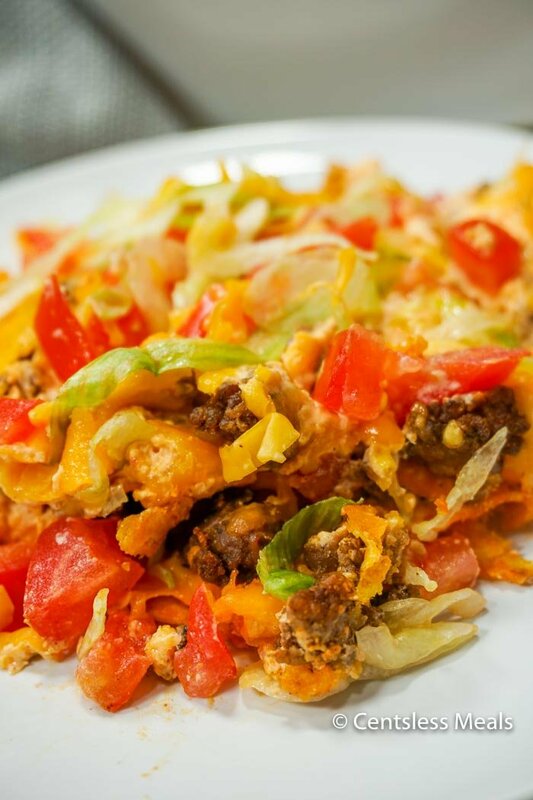 My Mom used to make this type of dish with Fritos rather than Doritos. If available, you might also get some small corn tortillas (taco size), quarter them, and deep fry for a few minutes until just starting to turn golden brown.. Buen provecho. You can bake this with the sour cream already mixed in? Instead of salsa can I use pico de gallo? Chris, you can skip the crescent rolls and butter. Add cream of mushroom soup. Also can be done with shredded chicken, cool ranch doritos ranch seasoning and cream of chicken. Crowd pleaser both ways. Prob short crust as cresent rolls are a thin crust. Actually my family makes it without the bottom crust. Jus start with the dortitos an go. Im going to get pizza dough and try it.